Speaking at the Game Developers Conference in San Francisco today, Nathan Vella argued that making unusual, risky games - such as its acclaimed "21st century update to the pioneering works of Miyamoto, Mechner and Chahi" - could actually be a much wiser business decision than attempting to court the mass market with broader, more middle-of-the-road fare. "I personally believe that one of the scariest parts of the massive success of the iOS platform is that it has taught developers that they should try and make games for everyone," he said. "It seems like an obvious choice because games like Angry Birds, Fruit Ninja and Cut the Rope sold 10, 20 million copies but, believe it or not, I actually I think that's a really bad business decision. "When you say 'I'm making a game for everyone' it actually means you're not really making a game for anyone." Vella went on to suggest that by trying something completely different, developers would find it much easier to get gamers to take notice of their efforts. "Everyone wants to make a million-selling game, and that's cool, but the problem with the hit-based mentality is it puts you in direct competition with all the other people who have the same hit-based mentality - the people who aren't creative enough to make a unique game, and the people who aren't willing to take the risk to make something that actually has a soul, or is fresh, or flies in the face of conventional wisdom. "Internally at Capy we talk a lot about playing the iPhone lottery - basically that's what happens when you try to compete against everyone who is trying to do the same thing. "You're trying to make the next Angry Birds, so what you're doing is basically walking up to a slot machine, putting the budget of your game into the slot, pulling the lever and praying to God that you get three f****** cherries. In reality, one in 10,000 maybe do okay - I don't know the odds." 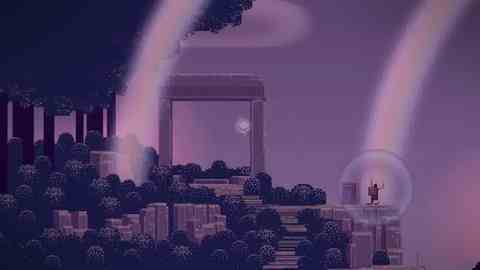 The success of Sword & Sworcery, argued Vella, proves that there is another way of doing things. The iOS audience is now so huge that even the smallest of niche audiences is big enough to yield significant sales if the game is good enough - so developers should chase them instead. "It's very important that your game stands out," he added. "Digital platforms are a f****** sea of games and basically every day that sea's tide rises and there's 10,000 more. "Different and risky games in reality are a very rare thing. On iOS, maybe one or two per cent fall into that risky category. So when standing out is so critical, is making something risky, really that risky? Or is it actually more risky to make something that doesn't stand out? "There's a subset of gamers who want to play something new. If you provide them with something worth playing you're not actually competing against 99 per cent of the market. You're competing with the one per cent. Sure, you might not reach the biggest slice of the money pie but you're ensuring your project has a really good chance of being successful." The approach certainly worked for Capy. Elsewhere during his talk, Vella revealed that the game has sold over 350,000 downloads since it launched back in March 2011. Vella's studio, whose Clash of Heroes: Might & Magic was among Eurogamer's games of 2011, is currently hard at work on Super TEAM Force.